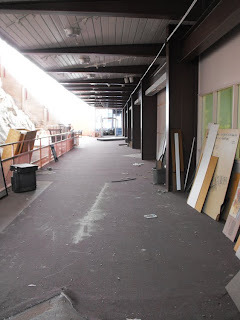 The entrance ramp once ran smoothly and seamlessly up to the double doors on the second floor into the QVC. 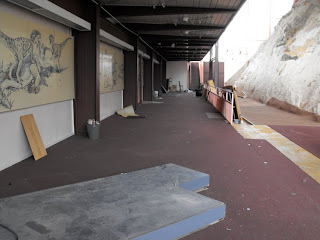 However, over time a step developed where the ramp met the door. 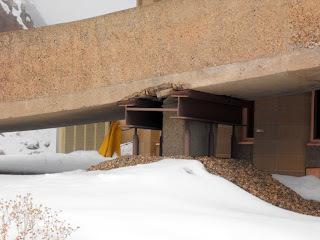 This was because building shifting was allow the ramp to drop where it met the building. 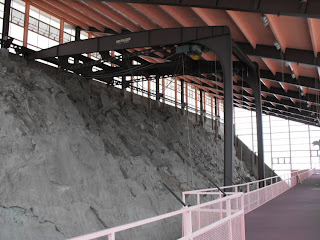 As an emergency action, steel girders were welded into vertical and horizontal positions to support the ramp. In these photos the red arrow points to an unpainted gap, which shows how much the ramp has dropped over the years. 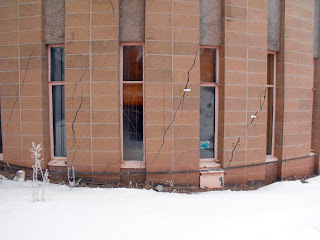 A major structural problem resulting from the swelling clays is that the south side of the building has been lifted significantly upward upwards. This has had many ramifications on building stability, but one of its more striking manifestations is that many floors now dip stongly towards the north. 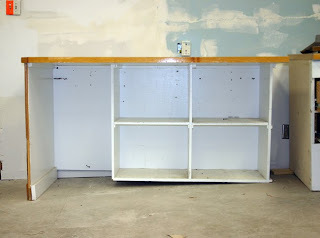 Here are some photos showing the slope and what needed to be done to keep equipment, such as a fume hood base, reasonably level. 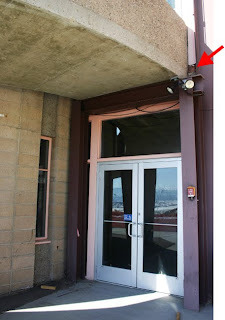 An east-west trending crack system runs most of the length of the building and out into the parking lot. 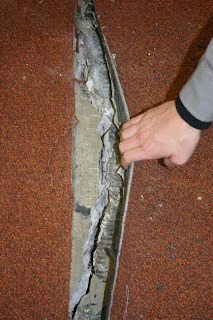 Vertical displacement along one side of the crack, as shown in the crack photo, can be over an inch. 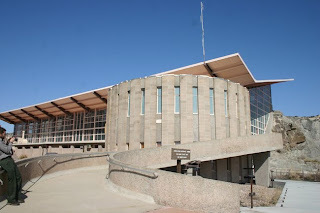 For those of you who may have never been to Dinosaur National Monument, here are a few photos of the building from the outside. From a distance it looks in good shape. 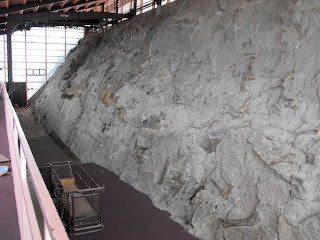 Built over the 150 foot long x 50 foot high quarry sandstone, it opened to the public in June of 1958. It won architectural awards for its innovative design. 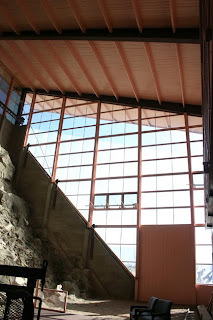 Extensive glass walls allowed for maximum ambient light and the gull shape roof reflected the rocks layers and excavated surface it was built over. A ramp led into the second floor of a turret like building that housed offices and a book store. Furthermore, it's look radically broke with the more traditional design of National Park Service visitor centers. Unfortunately the hydrophilic bentonitic mudstone beneath it would ultimately create stability problems that would spell its doom. Because of the very large dimensions of the fossil bearing sandstone, the QVC was designed to have glass walls to maximize ambient light inside the building. 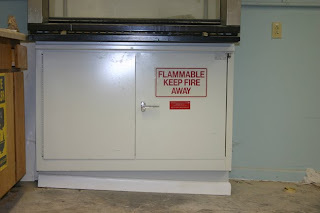 Because of shifting of the building, glass panels would break and shatter and were replaced years ago with plexiglass. One the east side of the building, movement has been so extreme that the entire glass wall has pulled away from the foundation by as much as three inches and is hanging by the welds at the top of the wall. The gap between the wall and the foundation has been filled in over the years with foam to keep rodents out. Here are a series of photos showing the wall and some of its more interesting details. 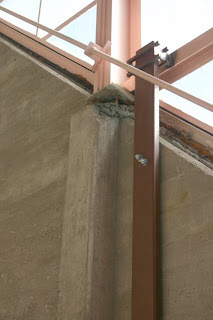 As part of the building fix the entire glass wall will be removed, rebuilt, and anchored to the foundation. Many of you may have visited the Quarry Visitor Center at one time, Here are a few last photos of the building before it is reconstructed. First is an overview of the face of the Carnegie Quarry. Protection of the quarry and its fossils during construction is a major issue. Some very creative ideas have come forth, more on that later. The large 4 ton crane hoist used during excavations will be dismantled and removed from the building. 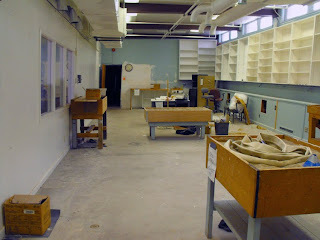 The paleo lab, now stripped of its collections and equipment. Finally, two views of the empty exhibit halls. 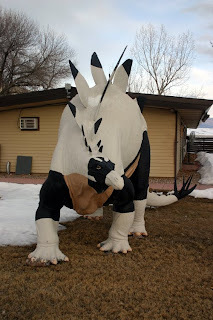 The rebuilt Quarry Visitor Center will include totally new exhibits, including many interesting vertebrate, invertebrate, and plant fossils not exhibited previously. Built on bentonitic mudstones, issues relating to building movement began soon after its opening in 1958. Ultimately the QVC became infamous as a funhouse with virtually no right angles. 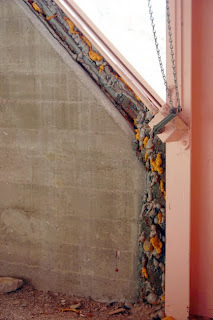 Here are pictures of some of my favorite structural "curiosities". 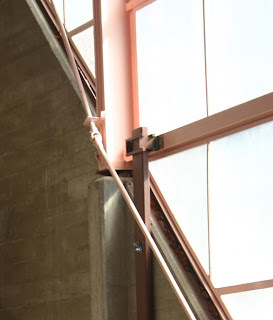 The collapsing entrance ramp to the second floor of the building has been shorn up for many years with wooden pilings, steel beams, and other fixes. 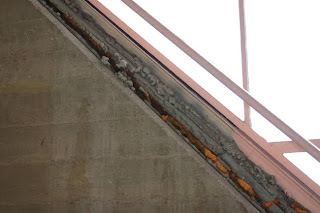 Here you can see one of the supports and the crumbling concrete on the underside of the ramp. 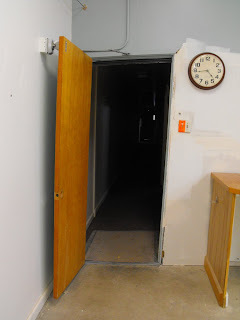 The rhombohedral door frame of the paleo lab. This is not skewed using photoshop. All distortion is 100% natural. 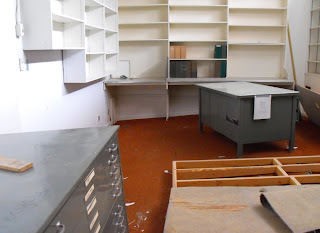 The paleo office showing its remarkable sloping floor --- the book shelves are about horizontal. Even where the floor appears to be level it slopes 5 inches over a distance of 8 feet. 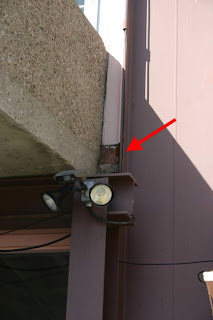 Engineers tell me they don't worry too much about cracks that run between cinderblocks. 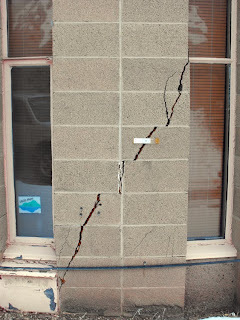 However, they seem to get a bit unnerved when the cracks cut across blocks, particularly when they occur in swarms, and especially when they are on the outer walls of a cylindrical building. 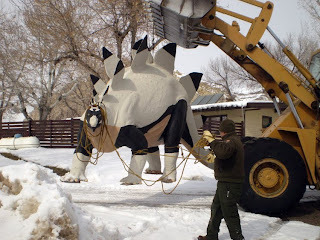 Here are the final photos of the Stegosaurus move. 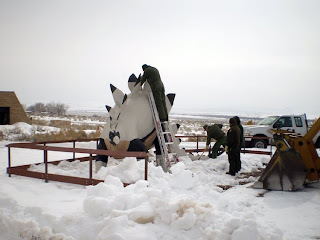 Here we are relocating a Stegosaurus about 1/2 mile from the closed Temporary Visitor Center to the Green River Resource Center where it now proudly stands guarding the Western Front. 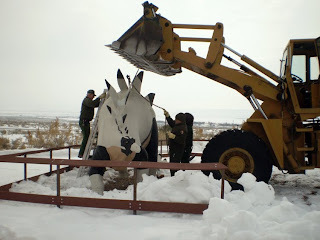 Calculating the appropriate tranquilizing dosage was a bit tricky. This was one of the models at the Sinclair Oil Exhibit at the 1964 World's Fair in Flushing Meadow, Queens, New York City. 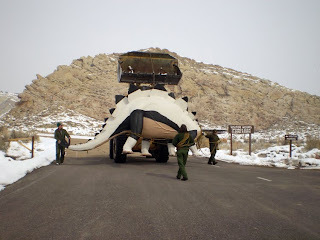 This blog is for those of you interested in the continuing saga of the Quarry Visitor Center at Dinosaur National Monument. The contract has been awarded for partial demolition and extensive rehab and rebuilding of that structure and a second building that will serve as a park wide visitor center. 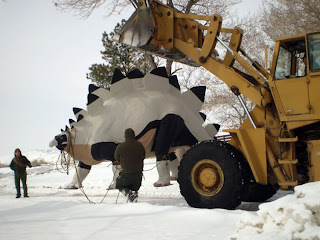 Work will begin in about a month and the QVC should be reopened to the public with new exhibits in about 18 months (early Fall 2011). 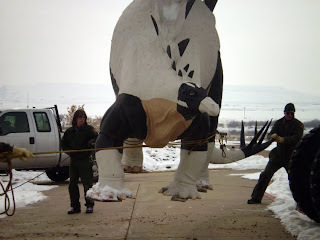 Allabach, S. 2000. Chapter 1. 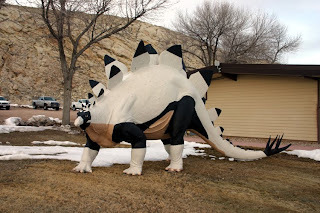 Quarry Visitor Center, Dinosaur National Monument, Jensen, Utah. 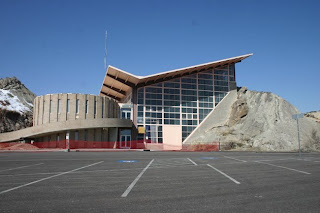 in: Mission 66 Visitor Centers: The History of a Building Type. 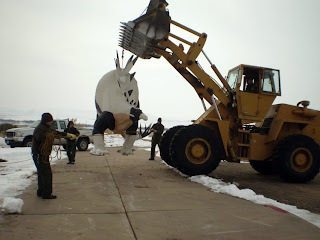 United States Department of the Interior, National Park Service, Cultural Resource Stewardship and Partnerships, Park Historic Structures and Cultural Landscapes Program, Washington, D.C.: pp. 39-66.